Interested in joining the Hughes Lab? Torrie joined the Hughes and Kimbro labs in September 2013, making the switch from freshwater to saltwater. Torrie is interested in factors regulating trophic dynamics and how bottom-up and top-down forces interact to affect species interactions. Her dissertation research focused on the effects of resource availability and predation on Daphnia life history and stoichiometry. Torrie is also interested in how inter- and intra-specific diversity impact trophic interactions. To look at this question, she conducted a study looking at the effects of Daphnia intraspecific diversity on consumer-resource population dynamics. In making the transition from freshwater to saltwater, Torrie is currently exploring similar questions on the role of diversity in trophic interactions using seagrass and salt marsh communities. Akana is a community ecologist interested in understanding variation in the strength of species interactions, particularly the role of intraspecific differences. She received her PhD from the University of California, San Diego where she studied causes of spatial variation in salt marsh species interactions. She joined the Hughes and Gouhier labs in January 2018 as an NSF Postdoctoral Research Fellow to research how intraspecific variation and diversity affect plant-plant and plant-herbivore interactions in salt marshes using both experimental and modeling approaches. At Northeastern, she will also work to broaden participation of under-represented groups in STEM through outreach to local middle and high school girls and collaborations with public school teachers to develop science curricula based in local ecosystems. Forest received his B.A. from Macalester College. After joining the Hughes and Kimbro labs as a research technician in 2013, Forest started as a PhD student in the Hughes lab in Fall 2015. 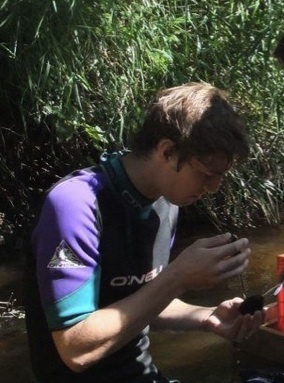 As a technician, he examined the effects of nutrient loading on trophic dynamics in a New England salt marsh, variation in population demographics among oyster reefs along the Atlantic and Gulf coasts of Florida, biogeographic patterns in the invasive reed Phragmites australis, and the impact of seed bank diversity on germination and early development in seagrass. While Forest is excited about all kinds of research in coastal ecosystems, his passion is exploring the link between biodiversity and ecosystem function. He is looking forward to taking courses this fall and delving into a new project investigating the effects of host diversity and density on disease incidence in seagrass. Theresa is a benthic community ecologist interested in informing coastal restoration using targeted experimental and modeling approaches. She joined the Hughes lab in 2016 to further examine the role of biodiversity, and/or other characteristics of resilient coastal ecosystems, in mediating the impacts of stressors on coastal habitats and their ability to function and provide ecosystem services. She is co-advised by Dr. Jonathan Grabowski. For her Master’s degree at the Virginia Institute of Marine Science, Theresa examined the biological impacts of shoreline development (both hardening and reconstruction following bulkhead removal with a living shoreline) on benthic biota. Prior to joining the Hughes lab, she developed strategies for monitoring and adaptive management of restoration as part of the Natural Resources Damage Assessment (NRDA) process following the Deepwater Horizon oil spill. Mallarie joined the Hughes and Gouhier labs in Fall of 2016 after receiving her Master's degree in Ecology at San Diego State University under Dr. Kevin Hovel. Her Master's thesis focused on how both local- and seascape-scale variation in eelgrass habitat structure interacts with fish body size to impact predator-prey relationships. For her dissertation, Mallarie is interested in using both empirical and theoretical modeling techniques to examine how the assemblage of coastal habitats impact metacommunity structure through predator movement and functional diversity. Sarit joined the Hughes Lab in Fall 2018 after two years as a research assistant at the Smithsonian National Museum of Natural History, where she studied the species boundaries and genetic diversity of open ocean zooplankton. Sarit is excited to bring her research closer to shore with the Hughes Lab. She is broadly interested in understanding patterns and processes underlying eco-evolutionary feedbacks in coastal systems and how feedback-mediated changes scale from within populations to communities and ecosystems. Sarit is particularly interested in coastal foundation species, including oysters, seagrasses, and mangroves, and in opportunities to leverage eco-evo feedbacks and genetic information in the design and implementation of coastal restoration plans. Robyn received her MS from the Three Seas Program at Northeastern. Her thesis examined differences in native and invasive species’ thermal sensitivity by assessing lethal temperature tolerance (LT50) and heat shock protein expression of native and invasive fouling community species (i.e. tunicates and bryozoans). She joined the Hughes lab at Florida State University as a technician and then began in the EEMB PhD program in Fall 2014. For her dissertation, she focused on the importance of biodiversity and the capacity for coastal resilience in marsh systems by examining the role that genetic variation of Spartina alterniflora, the dominant plant species throughout the southeastern US, has on saltmarsh communities. Her experiments have included: a) linking genotypic-associated traits to variation in species interactions, b) the relative importance of genotypic diversity compared to the associated environment and c) how environmental factors may alter diversity over time. Althea has a bachelor’s from Earlham College and master’s degree from William and Mary’s School of Marine Science. Her dissertation research explored the effects of biotic and abiotic context on species interactions in coastal vegetated ecosystems. One of her field experiments focused on how symbiosis between a salt marsh plant and root-associated fungi responds to changes in stress and resource availability. Another chapter of her dissertation addressed how the particular traits of a salt marsh plant help to ameliorate temperature stress for an intertidal invertebrate that associates closely with it and in turn enhances nutrient conditions for the plant. She is also interested in how the response to local conditions can depend on the traits of individuals. She used a field experiment and survey to examine how phenotypically distinct mangrove seedlings from different sites of origin respond to varying biotic and abiotic environments in common garden experiments at two field sites. Chris has a wide range of research interests in coastal ecology ranging from wetland to subtidal habitats. These fragile habitats provide enormous economic, recreational, and ecological values and need to be carefully monitored and protected. Her Master’s research at the University of Rhode Island examined the role that drifting macroalgal blooms played in salt marsh ecosystems and how their impacts altered trophic dynamics. For her PhD, she examined the invasion of a new macroalga, Daysisiphonia japonica, in New England waters. This invasive alga can be extremely abundant, comprising 50-90% of the algal biomass where it has invaded (Newton et al. 2013). Therefore, it is likely this invasion will significantly alter subtidal habitats and impact multiple trophic levels. In addition to examining these ecological impacts, she examined the factors that led to the successful establishment of this invasive species, such as rapid growth, high reproductive rates, and lower palatability than native species. Her research uses a combination of manipulative field and laboratory experiments, as both are necessary to thoroughly approach any scientific question. Amber's work is motivated by her interests in evolutionary fitness, adaptation, and the persistence of natural populations and their communities. Her M.S. project was inspired by the management questions of a Tribal biologist regarding the role of lacustrine versus riverine environments on seed size of Zizania palustris (Manoomin, wild rice). For her doctoral research she applied classical quantitative genetics methodology to empirically apply for the first time, the Fundamental Theorem of Natural Selection. This project was carried out with a pedigreed population of Chamaecrista fasciculata (partridge pea) in the natural selective environment of a prairie restored by the Shakopee Mdewakanton Sioux Community and included multiple generations as well as multiple growing years. In the Hughes and Lotterhos labs, she examined fitness and selection of a restored population of Spartina alterniflora.